Shows » Common Poorwills Can "Hibernate"
As the winter cold deepens, these petite members of the nightjar family can enter “torpor” — and may stay like that for hours, or even weeks! Common Poorwills don’t sing much when the mercury drops. But they can do something else that is remarkable. As the winter cold deepens, these petite members of the nightjar family can enter a hibernation-like state — and stay like that for hours — or even weeks! Scientists call it torpor. It happens when an animal slows its body functions to conserve energy and heat. When it’s summer in the Southwest, the call of a Common Poorwill greets the moonrise. The Common Poorwill doesn’t sing much when the mercury drops. But it can do something else that is remarkable. 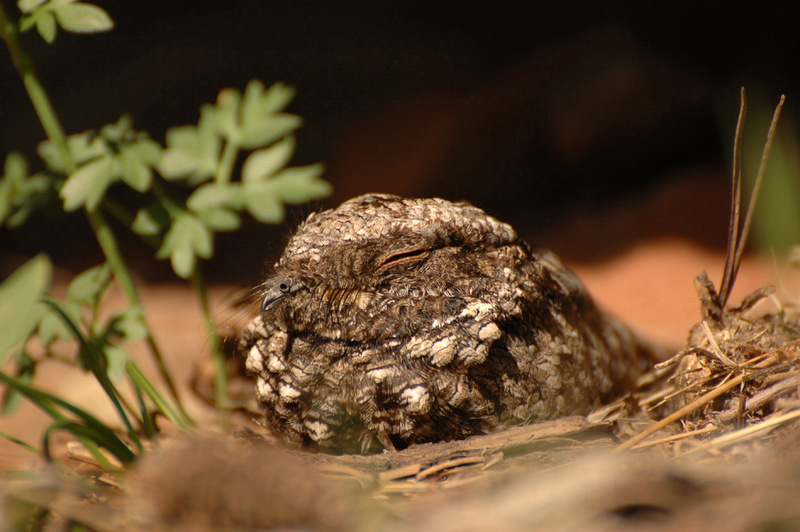 As the winter cold deepens, this petite member of the nightjar family can enter a hibernation-like state — and stay like that for hours — or even weeks! Scientists call it torpor. It happens when an animal slows its body functions to conserve energy and heat. The bird’s heart rate will slow; so does its breathing and body temperature. Several species of birds can go into brief states of torpor to conserve energy — hummingbirds, doves, and the poorwill’s close cousin, the whip-poor-will. But the Common Poorwill is unique in its ability to do so for such prolonged periods of time. Scientists suspect there may have been an evolutionary advantage for the poorwill if it could stick out the winter, instead of migrating. The poorwills that stay through the cold come out of their torpor as the temperature rises, the days lengthen, insects become abundant again, and the breeding season nears… and that is something to sing about. Bird sounds provided by The Macaulay Library of Natural Sounds at the Cornell Lab of Ornithology, Ithaca, New York. Recorded by: ML40634 G Keller; ML 195774 B McGuire. Plus Nature Sound 02 Wind mod soft. https://www.journals.uchicago.edu/doi/abs/10.1086/physzool.65.2.30158263 → poorwills of both sexes enter torpor regularly in April, May, and September, but not during the breeding season. I found no evidence that torpor was used only in energy emergencies or that the lunar cycle influenced the use of torpor.